Origin and Habitat: Namaqualand, Western Cape, South Africa. Habitat: It grows in crevices on granite shelves often under shrubs. 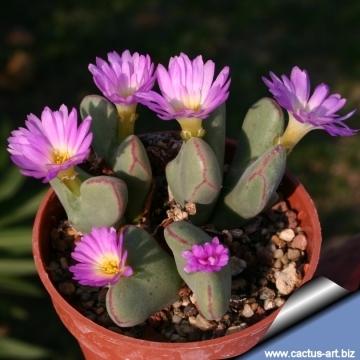 Description: Conophytum chauviniae is a dwarf rock-like perennial leaf-succulent, often very small, forming fairly large mats or domes of small greyish-green bodies with nice pink or purple blooms. Bodies (Paired leaves): Cuneate, bilobed, up to 35 mm long, 15 mm tall, pale green to bluish with red or purple lines, papillate, often transparent near fissure. The leaf-tips (lobes) are free and triangular in shape and keeled sometime with broad, arrowhead-shaped, deep red markings. Flowers: Solitary with a prominent perianth tube, petals magenta. Conophytum apiatum N.E.Br. : (subs. bilobum) has conspicuous dots upon its whitish-green surface. Distribution: Remhoogte and adjacent areas, Little Namaqualand, South Africa. Conophytum bilobum (Marloth) N.E.Br. : It is a very variable taxon with short internodes, leaf-tips (lobes) free, leaves 1 to 6 cm long, more or less triangular in shape and keeled. The flowers are large yellow. Conophytum bilobum subs. altum (L. Bolus) S.A.Hammer: has long internodes long with depauperate bodies, and small flowers. Conophytum bilobum var. elishae (N.E.Br.) S.A.Hammer: large growing bi-lobed species. A transparent zone can be seen just below the fissure and extends downwards. Conophytum bilobum subs. gracilistylum (L. Bolus) S.A.Hammer: has very slender, long-lobed, pale green bodies with a fine spotting, with pale pink flowers. Distribution: northwest of Bitterfontein, West Cape Province, South Africa. Conophytum bilobum lacteum hort. : White flowering form. Distribution: Kuboos mountains, Richtersveld, Little Namaqualand, Western Cape, South Africa. Conophytum chauviniae (Schwantes) S.A.Hammer: (subs. gracilistylum) has leaf-tips free and triangular with deep red markings. Flowers pink to magenta with a prominent perianth tube. Distribution: Namaqualand, Western Cape, South Africa. Conophytum christiansenianum L. Bolus: (subs. bilobum) has robust bodies 7 cm tall, 3 cm wide, leaf-tips free, 10-40 mm long, triangula and keeled. Flower yellow up to 3 cm. Distribution: Namaqualand, Western Cape, South Africa. Conophytum conradii L. Bolus: (subs. bilobum) Bodies 3,5 centimetres long and 9 mm whide, deep green, leaf-tips free, triangular and keeled. Flowers scentless yellow. Distribution: Cape Province, South Africa. 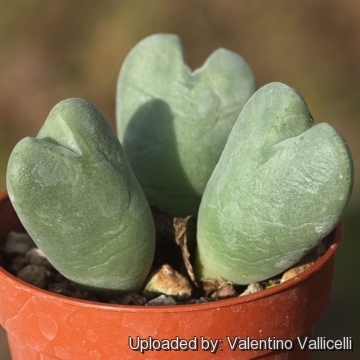 Conophytum cordatum Schick & Tischer: (subs. bilobum) has pink-violet blooms, bodies 20-25 mm high, 12-15 mm broad, and 8-10 mm thick cordate (heart-shaped) in outline and keeled. Distribution: western part of South Africa. 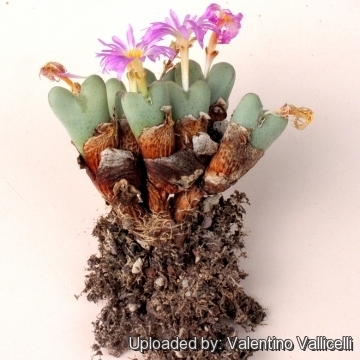 Conophytum corniferum Schick & Tischer: (subs. altum) The shape of the bodies are as a normal altum and the internodes are somewhat elongated as expected for that subspecies. Conophytum gracile N.E.Br. : (subs. altum) has short, erect, stems which are covered with old leaf sheaths. Distribution: Cape province, Little Namaqualand. Conophytum igniflorum n.n. : has fiery orange flowers in autumn that set this species apart from other bilobed Conophytums. It could be a natural hybrid. Origins unknown exactly. Conophytum lavisianum L. Bolus: (subs. bilobum) It is a southern "bilobum" form with bare body. Conophytum noisabisense L. Bolus: (subs. bilobum) Distribution: Little Namaqaland. 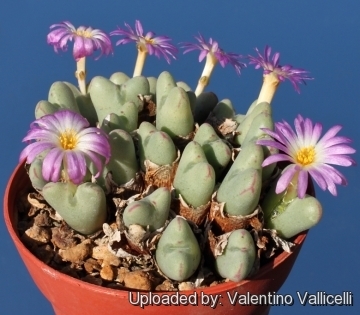 Conophytum ovatum L. Bolus: (subs. bilobum) has broader paired leaves and smaller flowers. Distribution: Namaqualand, South Africa. Conophytum piriforme L. Bolus: has robust piriform (pear-shaped) bodies narrowed toward the apex. Distribution: Kuboos mountains, Richtersveld, Little Namaqualand, North-West Cape Province, South Africa. Conophytum pluriforme L. Bolus: (subs. bilobum) bodies variable in shape. Conophytum simplum N.E.Br. : (subsp. bilobum) has small, almost cylindrical bodies 40-50 mm high, 10-12 mm thick lobes erect, 6 mm long and wide. Distribution: Cape province, Little Namaqualand. Conophytum supremum L. Bolus: (subs. bilobum) Thickness 3 cm, height 7 cm. Leaf-tips free and are 10 mm long, triangular and keeled. Margins green to purple. Distribution: Northern Cape and Little Namaqualand. 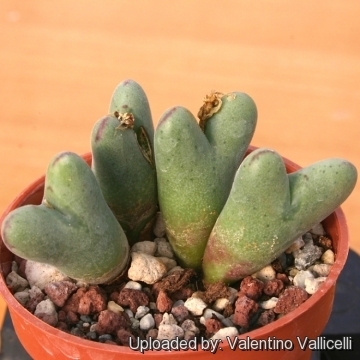 Conophytum vlakmynense L. Bolus: (subs. bilobum) Big, fat, bi-lobed species, with broad pale greyish green bodies. 2) Raimondo, D., von Staden, L., Foden, W., Victor, J.E., Helme, N.A., Turner, R.C., Kamundi, D.A. and Manyama, P.A. 2009. “Red List of South African Plants.” Strelitzia 25. South African National Biodiversity Institute, Pretoria. 3) Hammer, S. 1993. 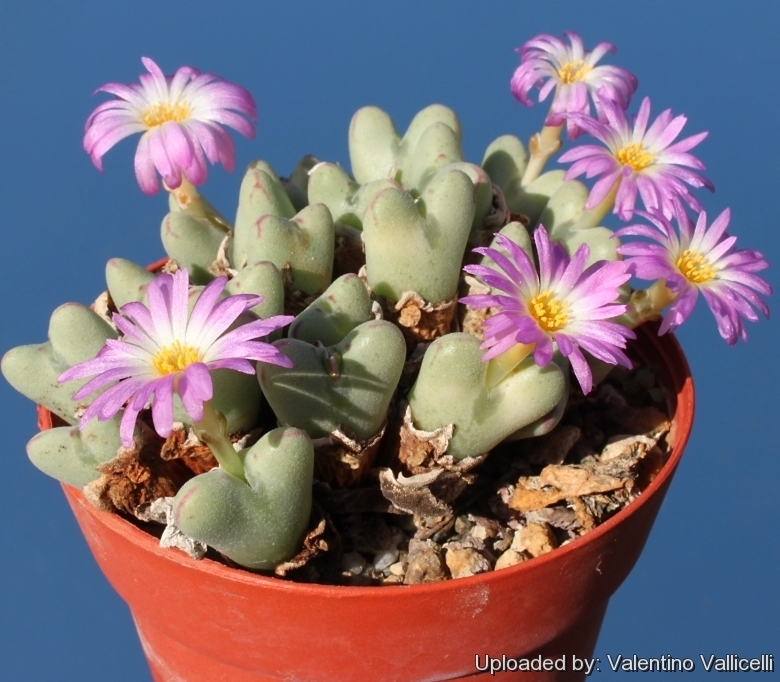 “The Genus Conophytum - A Conograph.” Succulent Plant Publications, Pretoria. 4) Hammer, S. 2002. “Dumpling and His Wife: New Views of the Genus Conophytum.” East Anglia Engraving Creative Colour Ltd, Norwich, England. Cultivation and Propagation: It is a "winter" grower which is most active from late winter until later spring and heading for summer dormancy, but in favourable growing conditions it keeps going over the summer too and doesn't need particular care. All the forms of Conophytum chauviniae have the advantage of ease of growth. Soil: Requires good drainage as it it is prone to root rot. It can grows outdoor in sunny, dry, rock crevices (protection against winter wet is required) It can also be cultivated in alpine house, in poor, drained soil. Watering: It requires little water; otherwise its epidermis breaks (resulting in unsightly scars). Water minimally in summer, (only when the plant starts shrivelling), but it will generally grow even in summer if given water. Water regularly in winter after the previous year's leaves have dried up. Requires good drainage. Fertilization: Feed it once during the growing season with a fertilizer specifically formulated for cactus succulents (poor in nitrogen), including all micro nutrients and trace elements diluted to ½ the strength recommended on the label. It thrives in poor soils and need a limited supplies of fertilizer to avoid the plants developing excess vegetation, which is easily attacked by fungal diseases. Exposure: Keep cool and shaded in summer, it needs full sun or light shade. Temperature: Hardy to -2°C. Ensure a very good ventilation. Repotting: Avoid to repot frequently. This plant may stay in the same pot for many years. Pests and diseases: It is vulnerable to mealybugs and rarely scale. Propagation:: It can be reproduced both by cuttings and seeds. Take the cutting from a grown-up mother plant. Each cutting must contain one or more heads along with a fraction of root. It is easily propagated by seed.